A denture is a removable replacement for missing teeth and surrounding tissues. If you are missing one or more teeth, whether from gum disease, tooth decay, or injury, dental dentures can replace your missing teeth and benefit your appearance, your smile, and your health. Without support from the denture, facial muscles can sag, making a person look older. Dentures also help restore your speech and eating patterns. Two types of dentures are available – complete and partial dentures. Complete dentures are used when all the teeth are missing. Complete dentures can be either “conventional” or “immediate.” Made after the teeth have been removed and the gum tissue has begun to heal, a conventional denture is ready for placement in the mouth about eight to 12 weeks after the teeth have been removed. Partial dentures are used when some natural teeth still remain. 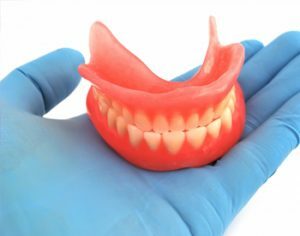 A removable partial denture or bridge usually consists of replacement teeth attached to a pink or gum-colored plastic base, which is connected by metal framework that holds the denture in place in the mouth. A fixed (permanent) bridge replaces one or more teeth by placing crowns on the teeth on either side of the space and attaching artificial teeth to them. A precision partial denture is removable and has internal attachments rather than clasps that attach to the adjacent crowns. This is a more natural-looking appliance. Not only does a partial denture fill in the spaces created by missing teeth, but it also prevents other teeth from changing position.